April was a whirl-wind adventure. It took a lot of bravery, and a couple leaps of faith, & has consumed my time to show me where I need better boundaries. Since I haven't had time to write blog posts, I shall distill it into a numbered list for your curious connivence. 1. Berkeley. Oh my goodness. I've wanted to visit the Bay area for years, and in the matter of less-than-two-weeks, I went from trading emails to spending hours with the amazingly daring Mati Rose, filming and brainstorming on her Daring Adventures in Paint workshop. It took a lot of courage to even send that first email, and then to book plane tickets, but it all worked out so amazingly, I'd like to mention the word serendipity. What an amazing work/vacation! I stayed at a house via AirBnb in the Berkeley Hills with the most adorable family with young kids. I had a bedroom, sitting room, and bathroom all to myself, with a gorgeous view of the bay at sunset. While I thought I'd spend the evenings relaxing, I ended up walking the area for yummy food, having an adventure after an oh-my-God-it's-a-Blick shopping spree, and met up with two long-time friends for a trip to Japantown (Daiso! Kinokunya!) who I'd never met in person but consider life-long sisters. 2. Synchronicity. While there, I discovered a deep joy as I worked, and realized I'd fallen into the thing I want to do most of all. 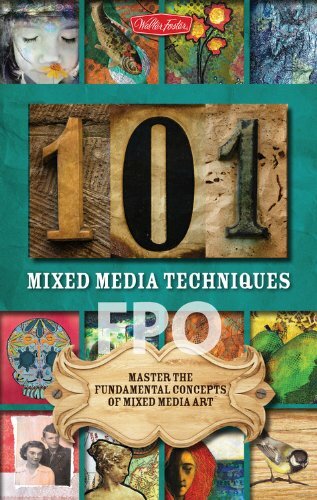 It's one thing to dream up an e-course, but another to figure out how to organize it all, split it, figure out what needs to be filmed and what doesn't....how to shoot you mid-creation. Lighting. Angles. Equipment. 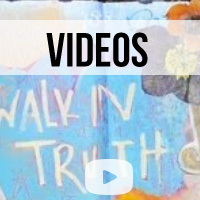 You need someone to talk it through, someone who's been a student and teacher, who knows technology and programming, who can take all that footage and put it together into a nice neat video package so you can focus on posting and interaction. I want to visit artists in their studios, record their courses, and put the video content together for them. I want to chat on Skype with you when you need someone to help you take a snarled, artistic vision and create a game plan. I want to help everyone make better videos with simple, easy-to-follow tips. I don't know what this job is called, or how I can keep up the momentum, or find more clients, but my heart sang when I was in Berkeley in a way it hasn't for a long time and I KNOW I have found my "thing." It's an amazing feeling that makes me feel radiant. 3. Shared Knowledge. My students in Digital Adventures & Creative Warriors have started to come out of their shells and create amazing artwork. It's one thing when you put everything together and give it to the world, and another to see those principles picked up and used just how you intended. I have a bit more time to pay attention to each student, and my small class size idea was a GOOD one. I'm so happy I made it! 4. Inspired. 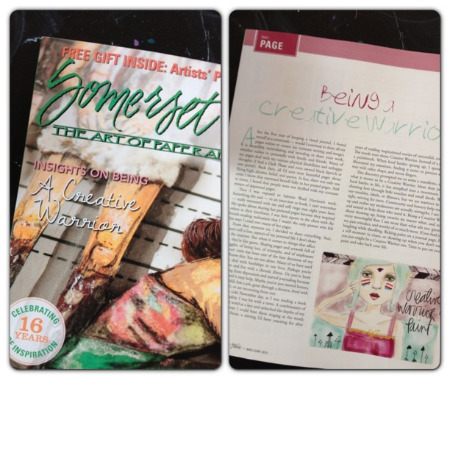 My article on Being a Creative Warrior is in the current issue of Somerset Studio, and is even mentioned on the cover! You can all now learn more about this movement I'm starting and become one yourself! I was so surprised and touched to get my copy in the mail, and it has a special spot in my studio. 5. Go big. I've decided it's time to use more paint and go big. I have a bunch of canvases in various stages of completion, as I want to make more original artwork to adorn your walls rather than focusing on just journal pages. This doesn't mean I'm going to stop, or share less, just that I'm making a commitment to myself to be an artist and dive deep and be brave and dare! 6. Roben-Marie's Mixed Media Stamps. These are wonderful! Everyone I've shared them with have love them, and I'm usually really picky about stamps. I keep a selection of them with me all the time, and they're so versatile! You can see me using them in my latest art journal speed painting video on YouTube! 7. 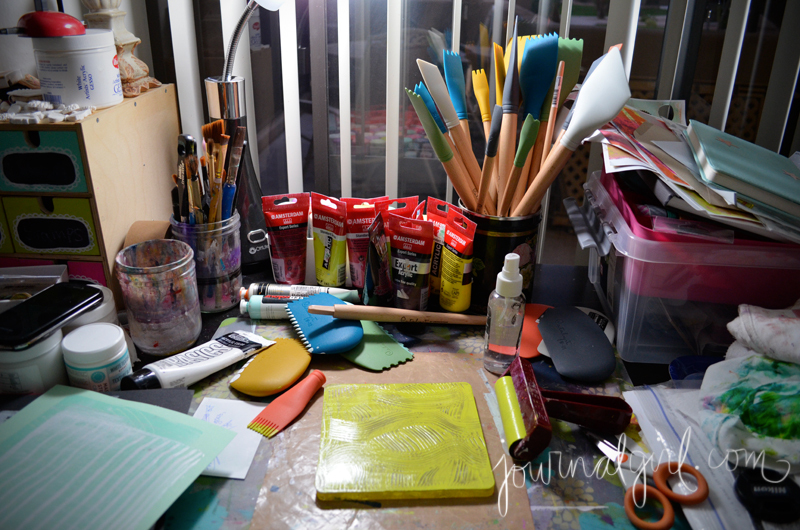 Artspiration Studio. We only have 50 hours left to meet our goal of opening a mixed-media and art journaling studio here in the East Valley of Phoenix! 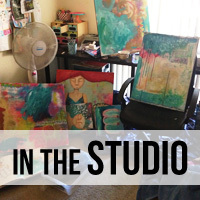 Join Tangie Baxter (a sweet, awesome artist & businesswoman!) in raising funds on Kickstarter to get us there! There are TONS of awesome rewards for each level! 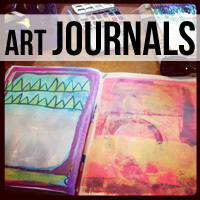 And here's some recent journal work. It's spinning off in a whole new direction, so I'm wibbly, but....the paint keeps flowing! I gave myself a little time to play today. I've been busy with a mega huge project that consumed my weekend and beginning of the week, and last week was fraught with hospitals and a reactive FMS flair-up. I'm rockin' this week without any of my pain medication, which has been full of random, crying breakdowns, a lot of self-love, and coping techniques. Oh, and amazing friends! Now, which one of you wants to help me with meals...and do any of you deliver? As some of you know, I'm participating in National Novel Writing Month this month, in my 10th year! 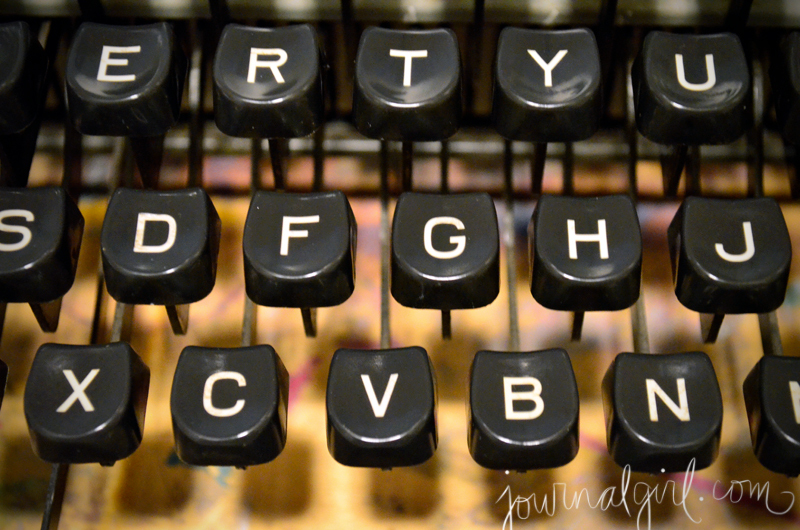 I decided to write my entire 50,000 word novel on my new-vintage Facit typewriter (it's older than my mother!). Yesterday marks the halfway point, and I am so excited to say I'm still going strong! It may sound hard to write 1,667 words every single day, but I find it clears my head, and allows me to sink into another world. Last night, I did 8 pages! Today, I took my machine in to be looked at, stuck keys adjusted, and to learn how the tabs work and see the inner workings. I have to say, they continue to fascinate me, and the local shop has so many kinds, I can stay there for hours just talking typewriter mechanics! If anyone wants to read a non-plotted or outlined, completely off the cuff, slightly sci-fi novel, well, I have it all scanned, up to page 61! I have been dying to play with my new Catalyst Tools (thank you!) since they arrived in a color-filled box. They are fantastic for playing with on your gel plate, making the awesomest patterns! I plan on some more play tonight, and layering up paper for little journaling kits & embellishments I plan to stick on Etsy for the holidays. The Catalyst Tools are just so colorful, intuitive, and ergonomic! They sit in your hand well, and I'm just having fun! I did a little painting with them today, with some modeling paste and texture gel, over an old canvas. When I was in Florida, one of the most beautiful and awe-inspiring things of my life - and simple. We visited the ocean at the end of the day, just before sunset, when the water was so cold, my lips turned a bit blue. As we warmed up on the beach, I witnessed birds skirting across the sea, so close, they could almost touch it. Watching them as the sun went down was amazing, and I found myself saying, "I wish I could take pictures with my mind and print them out," before I realized that's why I paint! Created with the Catalyst Tools, layers, acrylics, and crayons. I was just playing - it was fun to have pure play! And I love it...it says to me what I wanted to express. But what has made me happiest? Being driven to paint on a canvas again. Rather, Birch! I haven't done a large painting in awhile, even though I dream of doing so every night. Other things take my time, such as creating things for the 'net, putting together classes, admining orders, etc! But I've decided THIS weekend is for painting! I'll be transferring the antlers girl from my journal to the wood, and see what comes through. Expect lots of texture! And one last little thing - if you notice, the comments are disabled. I had a long discussion about this with friends, expressing my curiosity as to why my comments have dropped overall...and I think I need to remember WHY I blog, so I'm turning them off for a little bit. But you can always hit me up on Facebook, Twitter, Instagram, or send me an email! I love hearing from you, as I'm thinking my word for 2013 will be connection! It was the third time I’d walked out to find one waiting on my path. Curious, I bent down and picked it up, grey and white, freshly shed from the wings or tail of one of the pigeons that come to rest in the courtyards of our apartment complex after digging through the dumpsters of near-by restaurants. I never really paid attention to such things, random feathers or animals crossing my path, until I encountered both while wandering the woods of central Florida with a girl who walks with animals and sparkles like a little pixie faerie. Now, I find myself gathering all sorts of random bits — stones and sand, feathers, twigs, leaves, all placed in my art or on an alter that’s quickly swallowing up the top of an old white dresser. “Finding your way back to the security of home, returning to what you’ve forgotten, the strength of family,” she surmised from that much-loved edition of Animal Speak (I bought her the pocket guide before I left, a perfect-sized little book that fit into her backpack). At the time, I thought it meant my physical family, but now…I think the message goes a little deeper than that. One of the things I discovered by going outside myself, leaving my day-to-day surroundings, was I’d lost myself somewhere along the way. I used to write poetry and prose to connect with my deeper self. I’d swirl in long skirts and sit on the warm grass of parks, nestled under trees, and work on things. On writing and homework and drawing. I’d sit on the beach and write scripts and shove my shoes in my bag so I could wade out into the surf. As a child, I played with spirits and faeries (I met my Grandfather for the second time when I was six or seven, when his spirit tossed me into the air and I shrieked with laughter), created magical kingdoms, and made costumes from whatever I could find around the house. And somewhere along the way, I lost all that. There are things I don’t talk about much. Large chunks of my life left offline, mentioned with hesitation. What if they don’t believe me? What if they don’t like that sort of thing? What if they think I’m crazy? Pieces of my Wild Soul hidden in my mind, shared only with close friends. Bits that scream to be let out against the fear that kept me quiet. But if I remain silent, scared, and fearful of judgement, then what does that say to the girl just discovering this of herself? What does that say to others who may feel as I do, believe as I do? I hear stories. Lots of stories. Feel emotions and sometimes hear my name breathed into my ear as I fall asleep. Questions asked. Conversations overheard. From Spirit (or ghosts, or souls-on-Earth). It’s been my experience, from an early age, that many people don’t take kindly to the little blond girl with an angel guide as an imaginary friend, who knows things about you you’ve never told anyone else. Who claims to have chatted with relatives long-gone. I’ve been told I’m going to hell by a little boy who attended a religious school, scoffed at by a woman sitting in front of me on the train, laughed at by friends who think tarot cards are to play with, not respect. While my religious and spiritual practices are eclectic at best, with a place for the Virgin Mary, the Buddha, those many-faced Hindu goddesses, it’s been a long time since I identified myself as Christian (but still love church…a loving, soulful celebration of God? Definitely my thing!). I don’t mean to talk about religion all the time, now that I’m shifting and changing, sliding back into my own sealskin, long lost and hidden behind the mountains of lessons to be learned, but I know that my artistic practice is unfolding, sprinkling Spirit and inspiration across all I do. And it’s time to pull the intuition into all that I do. I truly believe that those who listen to Spirit, or God, or the Goddess, who take the time to be still and dive into the depths of their own Wild Souls, practice the core of wabi-sabi — that is, they go with the flow and, while they may find forks in the river or waterfalls to survive, they have grace; their faith and confidence help them tackle bigger challenges. It was harder for me to dive that deep when I was still acting as I thought I should (oh, that terrible word that enslaves so many!) instead of remembering that smiling, always-laughing girl of my youth. But now that I’ve reconnected, I am finding things come easily. My life is full of happy accidents, serendipity, and just right moments. In fact, every day this week is busy with projects, adventures, and paint on my fingers. Now, every time I walk to my car, or grab the mail, to walk and search for the treasures of nature I find myself drawn to use more and more of in my art, I smile at the feathers I spy in the grass. I’ve started my journey home to my heart, to my True Self, and know I’m on the right path when those little grey and white feathers mark the way. "feathers on my path" 12"x12" mixed-media on wood. available. 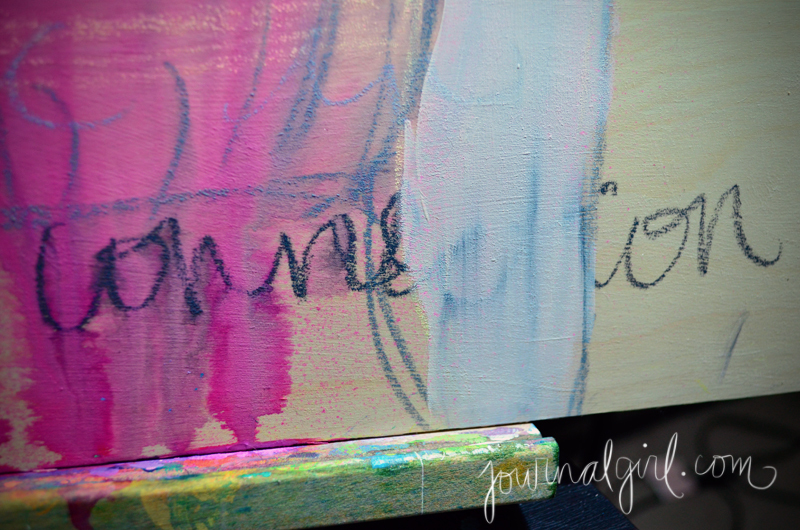 Creating a piece of art or journal page as a tutorial piece can be a bit intimidating! Imagine if you recorded yourself while working on a journal page, and you had to make it, well, work, as though you knew exactly what you’re doing and why. Usually, if things don’t go well, you start again. 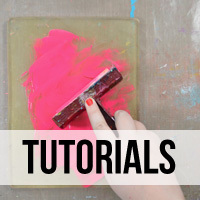 Or you record an in-process video, where things are sped up and you appear to be calm and serene while working, an artist master in her craft, who has the confidence to work and keep working toward creating a beautiful page. I’ve been teaching on-camera for five years, now, and I’ve had to re-shoot, for sure! I said everything going through my head. All my moments of indecision. The mean thoughts of my Inner Critic. The cheering of my Secret Partner (or the Universe, or God, or Divine, or whatever you may see as your connection to something larger than yourself). I put it all out there, to show you (or rather, the students of Life Book) what really goes on in the heads of all those artists out there you admire and think have no moments of doubt, or have overcome their Inner Critics. The thing is? I changed mine. She was fired, but came back because she promised to be nicer. Now, she helps me find areas to improve, mistakes in perspective, or places I can add just the right element to make a page wonderful. I'll have a print of this piece up in my Etsy shop this week (as part of the BIG update!). You can still join Life Book, a year-long celebration of YOU with guest teachers and a TON of content…and we’re just over halfway through! Click here to learn more and join! With One Palette (or Samie is a Cover Girl! Today, I discovered, in my mailbox, the current issue of Somerset Studio with my name on the cover. It made me squee. And dance a funny dance on my patio, which caught the attention of a woman walking by, who smiled and said hello. I stopped dancing just long enough to greet her back, then went back to dancing with my dog. I can say that this art — these pieces created in a flurry of movement and paint — seems to mark the beginning of a huge shift in my creative life. I feel myself falling further away from things like my Smash book (that hasn’t been worked on in weeks) and how I used to journal, and diving into layers of paint and hidden symbolism. This shift has nothing to do with calling myself an artist — I’ve considered myself an artist for years — but more to do with being happy with what I create. I love all these pieces and can’t wait to get them back to hang in my own space! Yes, I love what I’ve done before now, but these — there’s technique and depth and spontaneity and emotion. The result of things I happened upon in my journals that I now used somewhere else. And I just fell in love with these colors! At first, I was afraid I’d be limited by only being able to use three colors (plus black and white), but found it opened a whole new world of experimentation and application. How can I create contrast? How can I use shades and white and a bit of black? How can I discover depth when I can only express myself with such a limited palette? 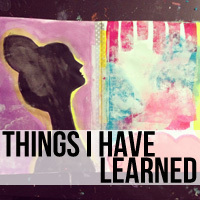 But in the end, I learned a lot more than I thought I would! It was almost like a mini-class, all packed into one wild ride of inspiration, where each moment was jam-packed with instruction and discovery, both about my art and myself. I feel like these grew organically, rising from the first applications of paint, those wisps of idea that got me going; the piece on loose canvas, for example, was my “scratch paper,” where brushes were wiped off, stencils cleaned, and doodles were drawn when I was stuck….and yet it turned into a beautiful piece of its own, and one I simply adore! 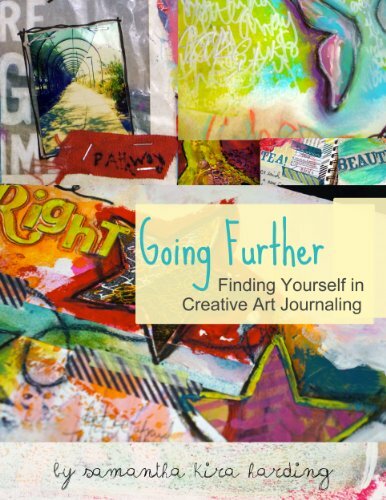 I’m thankful for the opportunity this article presented, and the art I’ve created since has been different and soulful and wonderful…at least now you can see where this new phase of artwork and journaling I’m dwelling in started. 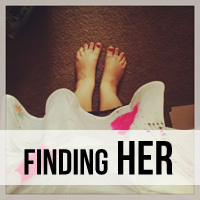 I’m super excited to share it here with you, both as a way to chronicle this time of major shift and growth in my life, and inspire you to create something wonderful and soulful, too! I should have prints of these pieces up in my Etsy shop, soon (and I don't link there now since it's a barren (wasteland!). You can grab your own copy of Somerset Studio on newsstands now -- or really, really soon! I hit that wall today. The I-want-to-create-so-bad-but-am-soooo-tired/sore/in-pain wall. The one we all hate. The one that drives us insane. In our support group, Steph wrote about how she had so many ideas but was in too much pain to do anything, something I wholeheartedly can identify with and have experienced myself. And Stephanie Corffee posted about how she’s been having issues with her hands and wondered what would happen if she couldn’t use them at a later point in her life. The short story is, we’ve all been there, at one time or another. Girl sits down on the floor in front of her TV and puts a movie on (Anchorman!). Girl gets up and sits in chair. Girl goes back to her art supplies after 15 minutes. I wasn’t going to accept that I couldn’t do art. I wouldn’t. Nolwenn told me over IM to not push myself because it wouldn’t do me any good. I told her, “But I wanna paint!” Taking breaks is my way of honoring my body’s wishes (when they don’t line up with my own! ), so I kept getting up, resting, and then sitting back on the floor. But sometimes, you just can’t win. And you need to be okay with that. If your body or mind is telling you that it isn’t in the cards to sit up and paint, then don’t. I know you’re going to want to, and I will tell you right now — I stopped, at a certain point, when I knew the art I’d create wouldn’t be as good as what I’d make when I was feeling better. In fact, the longer I kept resting and coming back, the less joy I got from the act of creating. When I hit that wall, I was creating to win, not to have fun. And no one wins in that game. How do you know when it’s time to stop creating? When your pain wins over the art. You’ll be sitting there merrily painting and then BAM, you feel the pain in your joints or back or anywhere else it likes to live. It’ll break through the happy fog of creativity and say hi really, really loudly, and that is when you know it’s time to step away and maybe come back tomorrow. And while you’re resting, you can doodle. Or dream. Or prep in your head. Make lists. Just because you’re not actively creating doesn’t mean you’re not doing anything. There’s so much you can do from a couch or comfy chair or bed, while your body rests. Because you want to be able to hit the ground running tomorrow, and so you rest for today. A little bit of art, 15 minutes every day, can create a rich, colorful life. The work above was done in my Smash book, with stencils and craft paint. 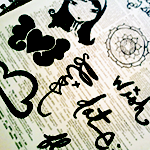 Yesterday night, I stamped in my journal with alphabet stamps and black ink. And it is enough. I wrote this essay at 1am on Saturday, before I finished the novel. I can now say OMG you must read this novel because of it's beauty, honesty, humor, and thought. I miss these characters, but am thankful they were brought into my life by chance (A wish list fill by Teresa, who's note I carry in my house sweater pocket). In the middle of reading my book of the moment (“The Fault in Our Stars” by John Green, who’s writing is so beautiful, funny, and sad at the same time, I’m glad this book will throw more money at him to keep writing beautiful books) and a line jumped out at me that got me thinking. And yes, dear reader, I have actually paused reading said book to write this, propped up in my bed at a quarter to one in the morning. But if you, like me, are unfortunate Side-Effects (as Hazel calls us) of Disease, then you know just how much work it is. Oh, it may not look like much on the outside, and if you met me in the street without having read or seen my vastly transparent digital life (side-note: is there such a thing as too much authenticity? ), you would have to be as hyper-observant as Sherlock Holmes (and here I’m thinking more BBC Sherlock than any other, though I do enjoy a good Rathbone Sherlock from time to time) to know there was anything less-than-healthy about me. And since I’m pretty sure you’re not Sherlock, nor any of his contemporary incarnations, I’ll lay down the clues for you, since I’m in a helpful mood: I walk with a slight limp, grimace when I sit or stand up, and move constantly. In fact, that is the one clue my mother can pick up with alarming speed, though that might be from prolonged exposure to, well, me. My twitchiness and inability to sit still increases in relation to my pain level, and this can be quite annoying, I’m sure, when you’re sitting next to me. I don’t notice it myself, but that’s probably because I’m trying to distract myself from noticing on purpose. Quite a lot of acting goes into Living With an Illness That Will Never Leave — you learn to project smiles and excitement when you feel like a zombie out for brains, and resist the knee-jerk reaction to answer the question of “How are you?” with the truth (which would probably make the asker uncomfortable — and that’s okay, since most people aren’t equipped with how to respond when someone admits unrelenting pain and fatigue coupled with Medical Drama when all you wanted was a good or alright in response). But acting isn’t the only work you do. I currently have 5 prescription bottles on my nightstand, with another tucked away inside, one in my purse, one I haven’t filled for years since I’m uninsured (America: get your act together, please!). I need to keep track of refill dates and how many refills are left, then check when my next doctor’s appointment is to make sure I won’t run into any bumps (I usually do, as one of my medications isn’t taken at the high dose, normally, so pharmacies are always running out of it). I have to make sure there is a back-up dosage of medication with me at all times in case I go out somewhere and am too fatigued to make it home — friends and family have been known to stay on the phone with me to make sure I stay awake. Then there’s the simple act of Living With an Illness. Going up and down stairs is not fun for me in the least, and yes, person watching me hit the elevator button, I am going to elect to use it to go up one floor despite appearing young enough to not need to. People love to judge with the eyes. This is where I roll mine. There are the times when you’re asymptomatic, or in a flare up (affectionately misspelled during my times as Flair Ups, which sound so much more fun, don’t they? Also, there is no spell check on my cell phone and computers usually make me sick when rolling with the waves of pain) when all I want to do is crawl under my covers and die — I’ve been known to punch my legs (the main source of nighttime OMG Kill Me times), pull out hair, slam my fists into the mattress, and so on. When all I can do is sit on the couch or lay in bed, caught between asleep and awake, unable to fully commit to either. And even on good days, like today, where I managed to run a few errands, play with paint a bit, and smile more often than not, I come home to rest my body because it simply doesn’t want to move anymore. Like it’s given up on it’s one and only job. Get it together, body! How many times have I berated myself for not getting much done in a day? How many times have I gone to sleep feeling guilty because I only managed to cross one or two things off my to-do list? When I go back to examine what I did that day, I see large holes of time used for what? Nothing? Rest? An impromptu Netflix-induced television marathon? I beat myself up even more for this unaccounted for time in my day, feeling it could have been put to better use. But if I really look at it, I was probably spending a lot of time busy Being Sick. I never really considered Being Sick as busy or something requiring more of my time. I’ve often fought against my limits, measuring my output to that of others who are Not Sick, striving to achieve more if only to prove my worth to society. Shifting self-care from the Indulgent column to the Work column doesn’t change the inherent facts of the case, simply allows for a bit more slack to be thrown my way when things haven’t gotten done and I’m still in my pajamas at 8pm, having watched four episodes of “Hoarders” as a way to tell myself my apartment doesn’t really need to be cleaned. In fact, re-organizing Being Sick to something you can possibly be busy doing gives it the proper time it requires in a daily schedule to stave off those asymptomatic times. Ask a bunch of us, and we’ll tell you of times we’ve bounced back a little too quickly simply because we were feeling a bit like complainers. Which is my cue to stop typing this essay and get back to reading, as I only just removed my wrist brace and typing 1200 words was probably a bit too much, too fast. I’ll be busy Mending tomorrow, and that’s a hard job all by itself.